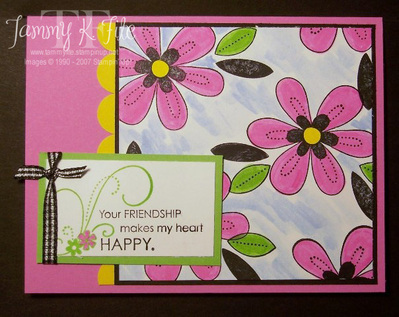 I love Janelle Richmond's blog--she posts sketch challenges for both cards and scrapbooks! She has a call for new designers--click here for the details! Anyhow, I decided to submit a card or two for the designer call! Wouldnt' that be exciting!!! Well, keep your fingers crossed for me!! Here are two cards I made using the sketch. 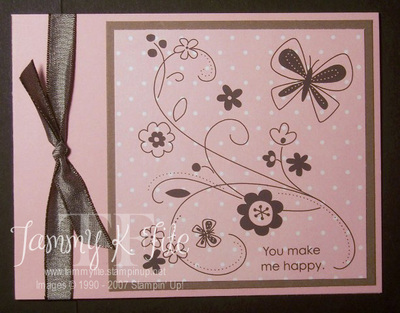 This card uses Basic Black for the card base, then layered with Whisper White and Purely Pomegranate. I used Basic Gray and Purely Pomagranate inks. 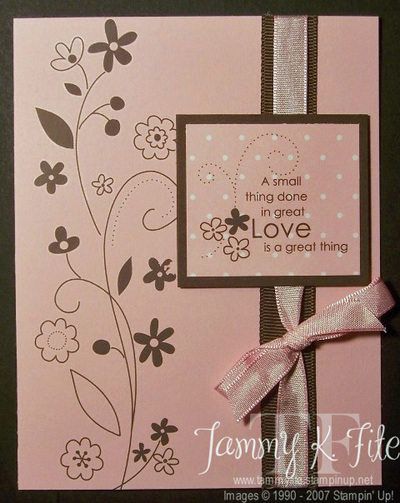 The background was made using the Boho Backgrounds set, and the sentiment is from the Together Forever stamp set. The heart is from the Sticky Cuts Letters, and covered with the Rose Pink glitter from the Fine Cosmo Glitter Stack. 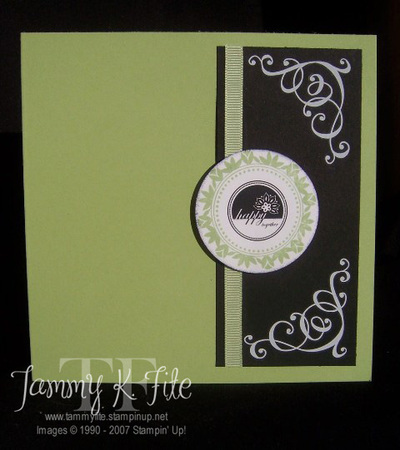 This card starts with a Certainly Celery card base--it's a 5 1/2" square card. 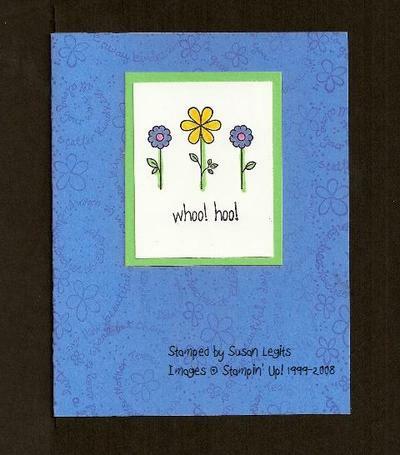 Again, I used the Together Forever stamp set for the celery circle, but all the other images are rub-ons! Hope you're all having a great week!! I'll post again when we get home from Phoenix!! 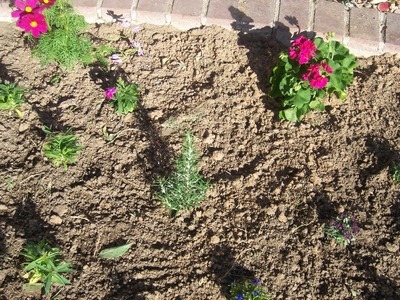 And, here's my side of the garden. 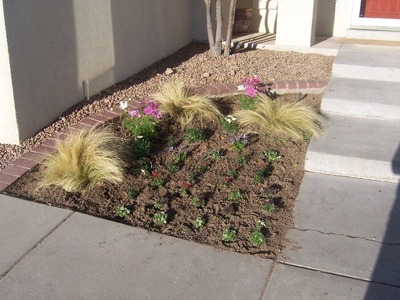 The grasses are a year old, but the rest is new. 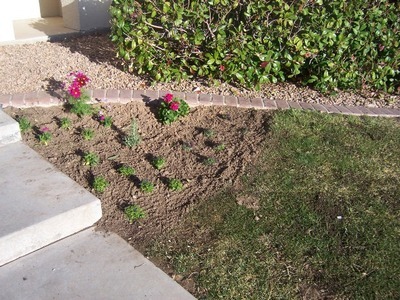 I'm not much of a gardener, so we usually just buy annuals, and start over each year! 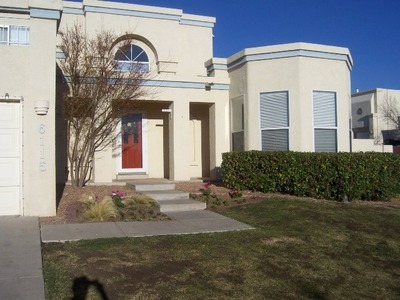 And, here's the front of the house! It looks so neat and clean!! I love spring!!! Enjoy your week!! We're off to Phoenix for a baseball tournament! I hope to have some of my own creations up soon!!! I just haven't had time to stamp lately!!! But, it's spring break--WOOHOO!!! First Communion and a RAK! Tonight my youngest son is doing his first communion!! I can't believe it--time flies. These boys are growing up too fast for me. He's very excited about it all, and so are we!! This card is from my wonderful upline, Sherrie!! 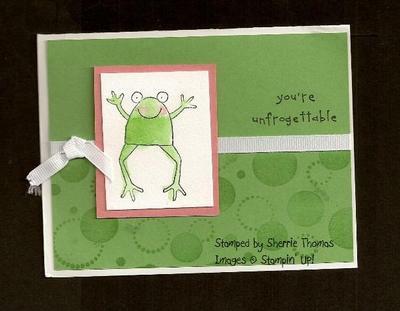 It's made with the Unfrogettable stamp set! That's on my very long wish list!!! :-) You can see more of Sherrie's amazing talent here. I love the way this turned out!!! I was so excited about the ribbon! (okay, so I'm easily excited!!) I layered the pink taffeta ribbon over the 5/8" Chocolate chip grosgrain!! I think it's so pretty!!! Today starts the wonderful Free Wheeling Promotion!!! Below is a list of the stamp sets/wheels that are included!! Some of my favorites are in there!! If you order by Easter Sunday, you'll get FREE shipping!!! And, feel free to include more in your order!!! But, to get the FREE shipping, you must include on of the stamp sets on special, or spend $50 or more. 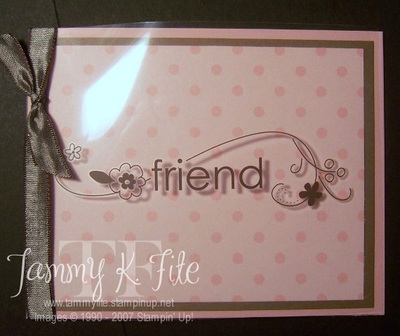 Here's another card done with the Chocolate Chip Rub-ons!! This is also Pretty in PInk and Close to Cocoa. Sorry for the photo--I usually use natural light, but it was too late in the evening, and I was impatient!! Both boys lost their first games this morning, so we were home much earlier than expected! They were bummed--both teams played well, it just wasn't in the cards!! I wish I had had my video camera--my youngest son, Brandon, is a very thin boy! He was pitching, and the winds were really strong--it was so funny watching him just try to stand up!! The winds are terrible here in New Mexico this time of year! Every March and April, I start looking for a new place to live--FAR away from here!! haha!! But, the other ten months are just about perfect, weather-wise, so I hang in there! I used the Chocolate Chip rubons from the Sale-a-bration set, Love and Happiness. The paper is Pretty in Pink and Close to Cocoa, with the Chocolate chip taffeta ribbon. 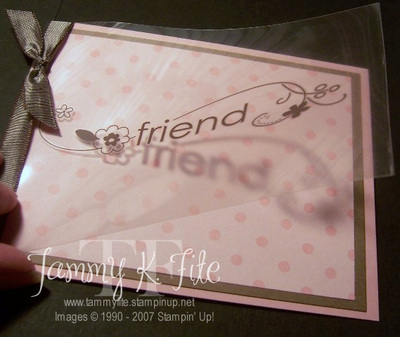 The rubons were applied to the transparency, which was wrapped around the pink cardstock. I was really happy with the way it turned out!! Now to figure out who to send it to.....................any ideas? Hi!! We had a wonderful day of baseball today!!! Both boys had loads of fun!! Watching my boys play baseball is one of my favorite things to do! I'm not sure I like it--what do you think? What would you change? Leave your suggestions in the comments--I'll use them, and post the new card!! Black Stazon and Green Galore ink. Here's another sketch challenge! This is from Splitcoaststampers! I used Almost Amethyst as my card base, then layered basic black and Whisper white. The central image is a rub-on applied to Almost Amethyst Prints designer paper. In fact, all the images, even the sentiment, are rub-ons!! 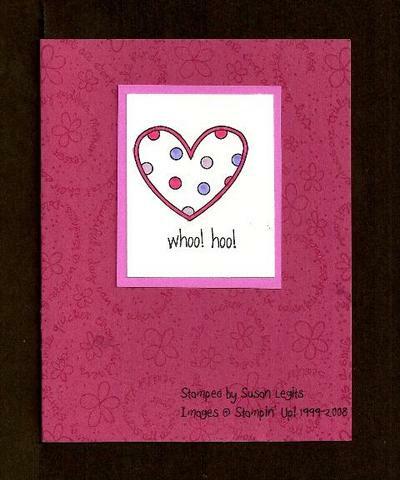 From the Love & Happiness rub-ons in the Sale-a-bration mini catalog!! Just two more days to get these!!! !